Ozothamnus ledifolius AGM Reddish buds open to small white flowers in June. Yellowish green leaves, curled at the edges, evergreen. Height and Spread a small dense shrub 1 to 1.5 metres. Ozothamnus rosmarinifolius Clusters of red buds open to fragrant white flowers, June. Small dark green leaves, silver on the back, evergreen. Height a medium sized upright shrub, 1.5 to 2 metres. Spread 1 to 1.5 metres. 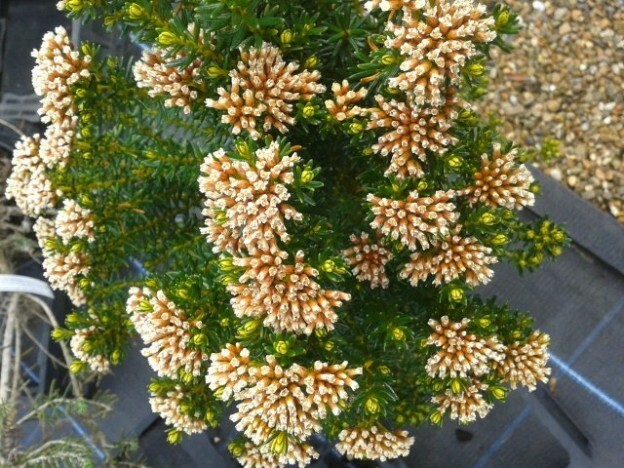 Ozothamnus rosmarinifolius ‘Silver Jubilee’ AGM Clusters of red buds open to fragrant white flowers, June. Small, silvery leaves, evergreen. Height a medium sized upright shrub, 1.5 to 2 metres. Spread 1 to 1.5 metres. Ozothamnus ‘Threave Seedling’ Clusters of red buds open to fragrant white flowers, June. Small, matt grey leaves, evergreen. Height a medium sized upright shrub, 1.5 to 2 metres. Spread 1 to 1.5 metres.